In a world first, a Wallaby fosters Tree Kangaroo after innovative emergency surgical procedure by the Adelaide Zoo in Australia. A wallaby fosters a tree-kangaroo in world first at the Adelaide Zoo, Australia. According to The Daily Mail, the zoo successfully implemented a decades old technique between the two marsupial species last November. Makaia was born in November 2014. 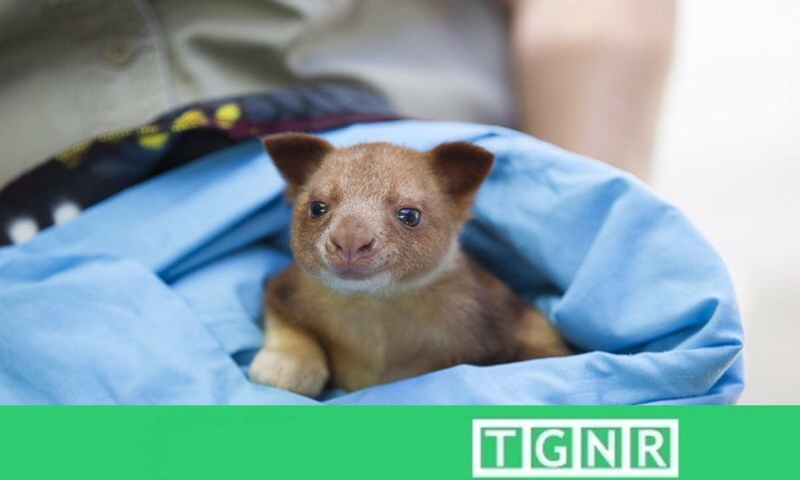 The endangered Goodfellow’s tree-kangaroo (denrolagus goodfellowi goodfellowi) was still a peanut sized embryo when his mother died from injuries sustained from a fallen tree branch – an unfortunate hazard of the tree kangaroo’s arboreal nature. Luckily for the 47 day old ‘roo, who was too young to be hand-reared, staff at the Adelaide Zoo knew what to do. The zoo developed “cross-fostering”, a type of marsupial surrogacy, in the 1980’s. Originally intended for endangered wallaby species, this reproductive strategy transfers a newborn joey to a lactating foster mother of another species. This permits the first wallaby mother to become fertile again and thus reproduce more quickly. The procedure is very successful with Wallaby’s, however its undertaking is entirely new for marsupials, let alone the distantly related tree-kangaroo. “Cross-fostering” procedure requires a veterinarian to remove the embryonic joey from one pouch and placing him/her in a surrogate. For Makaia, however, cross-fostering was the only option. Enter surrogate wallaby mom Missy Fitton, a yellow-footed rock wallaby. As quickly and safely as possible for both joey and Missy, Makaia – weighing only 29 grams – was transferred to Missy’s pouch. Vets and keepers alike watched eagerly for signs of growth. To the joy of Team Leader Gayl Males, only days later she observed “tiny ripples of movement,” confirming Makaia was nursing from Missy’s milk. Finally, on 31 January 2015, Makaia poked his head out of Missy’s pouch. Makaia peeks out of wallaby foster mom Missy Fitton’s pouch. At first glance the two made an odd couple with Makaia’s red-gold fur and blue eyes contrasting Missy’s grey and tan coloring. All the same, Missy devotedly cared for her foster son while still mothering her own natural offspring. One difference that they could not overcome, however, was the difference in rate of growth between wallaby and tree kangaroo. After almost four months together, Makaia was too big for Missy’s pouch and needed to be hand reared. For now, Makaia splits his time between Adelaide Zoo and Gayl Males home until his is weaned from formula milk sometime between 15-18 months of age. Adelaide Zoo hopes this cross species cross-fostering success will encourage research into the technique and create new opportunities for cooperative rearing between different endangered species.